8 for you were formerly darkness, but now you are Light in the Lord; walk as children of Light. 9 (for the fruit of the Light consists in all goodness and righteousness and truth), 10 trying to learn what is pleasing to the Lord. 11 Do not participate in the unfruitful deeds of darkness, but instead even expose them. In this passage we see Jesus both as Savior – which will say, mercy and gift – and as a role model. It is a passage that is first and foremost addressed to those who are Christians, those who already belong to the Lord. “-but now you are Light in the Lord” (v.8), he writes to those he addresses to. But that doesn’t mean that it doesn’t also have a message to those who still stands on the outside, a message from the Lord, exactly to you. Just think about that He, the creator of heaven and earth, is addressing, and speaks to you! If people would realize this, the bible would be lying on all tables around the country. But unbelief is still great. “Become imitators of God,” we read (v.1) – and then we probably think that we will first do a lot of good deeds, and not do many evil ones – and that is also true, as we see from the passage: “Trying to learn what is pleasing to the Lord. Do not participate in the unfruitful deeds of darkness, but instead even expose them.” (v.10-11). Which means: Go for what you can see the Scripture sees is right, and avoid that which is not. A Christian cannot live in something that the Scripture says is sin. – No, you cannot even live in it and be calm if you doubt that it’s riht. But to become an imitator of God is something far more than that, and that is also revealed in this passage, if you can see it. It says very clearly what God above all has delighted in – it says about something is a fragrant aroma for Him (v.2b), and just listen to what that is! 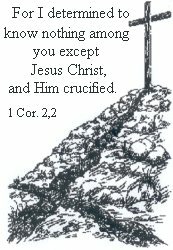 – Listen to it and let it sink in, whether you are a Christian or not, because this is for everybody: “- Christ also loved you and gave Himself up for us, an offering and a sacrifice.” (v.2). This, that He gave Himself for us - for you who’s sitting here right now - as a gift and a sacrifice, is a fragrant aroma for God. It’s like a nice fragrant for Him, it pleases and makes His heart glad, His whole attention is focused on what you and me are concerned: What Jesus Has done for us! And then you barely dear to believe, that it also concerns you! – That it can also concern for someone like yourself, who’ve only sinned and lived with your back towards God, busy with pleasing your own wants and need? – And then you read this, completely against all your worrying thoughts of doubt, that it on the contrary is like a fragrant aroma for God! What is it then to become an imitator of God? Do you see – as soon as one starts to realize this, the pieces will soon start to fall into place in other areas than what they did before. To become an imitator of God is first and foremost this that which is a fragrant aroma for Him, also has become the same for you. Then you have become one spirit with Him – you are busy with and rejoice over the same thing - that is Jesus Christ gift and sacrifice. It says that there is joy in heaven among God’s angels over one soul who sees this – and God’s angels wouldn’t rejoice over something that isn’t also God’s joy! And then you perhaps sit there and think about in meetings after meetings: Should I really dear to receive this? – Can I believe that this concerns someone like me? – And then the Scripture testifies that exactly that is the joy of heaven – that you believe and receive it. I will read these two verses from the passage: “Therefore be imitators of God, as beloved children; and walk in love, just as Christ also loved you and gave Himself up for us, an offering and a sacrifice to God as a fragrant aroma.” (v.1-2). What is then the first thing you think about after your own natural way of thinking: Oh, I must live more like Jesus; I must be more like He was and is! – And it’s not wrong to think like that – but first of all you have to realize in your heart: This is the way Jesus is towards me. – He has loved me and loves me so that He gave Himself as a gift and a sacrifice for me! – This is how He looks at me in this moment! Without this light in your heart – as the Scripture calls it – all deeds become full of strife and laws, and as soon as this message becomes blurred for a child of God, it also just remains with strife and laws. There is a word in the Scripture which is hard to comprehend for everyone: “But where sin increased, grace abounded all the more.” (Rom.5:20). So, if my sin had been much bigger than what it is – yes, then grace would be too! Isn’t that a word to ponder on for the rest of the life? – Or what about this: “If we are faithless, He remains faithful, for He cannot deny Himself.” (2 Tim.2:13). Can you comprehend that He’s like this? – There is hardly anything worse than being faithless! It’s one of the lowest outcomes of our sin. Just think about that you who are married or in a relationship – to be betrayed! Faithlessness is an evil case. Shouldn’t you then dear to approach Him? Maybe you jumped right now? But it is true! – Our salvation isn’t something diffuse, something that just hangs in the air – no, it is founded on completely concrete works done here on earth – but that is Jesus works and not ours. It is this deed that is a fragrant aroma for God! Our salvation rests on a mountain ground, God’s own deeds. Yes, then you understand, I have to believe that this will do. Then His admonition comes to you who has got the gift to see this: “For you were formerly darkness, but now you are Light in the Lord; walk as children of Light.” (v.8). You have got part in the light, and are a child of the light – yes, light in the Lord, as it is expressed here – do you want to return to darkness then, the strife under the deeds of law, lacking certainty of salvation, a blur understanding of the Lord etc.? – Wouldn’t you rather see that which is a fragrant aroma for God? “Christ also loved you and gave Himself up for us, an offering and a sacrifice to God.”(v.2). Again, if you have forgotten it already, this is what pleases God’s heart. Just hear a few words about this at the end here – and I would very much like if you who has a bible with you, look up and read it yourself. First: “In this is love, not that we loved God, but that He loved us and sent His Son to be the propitiation for our sins.” (1 Joh.4:10). – “If we receive the testimony of men, the testimony of God is greater; for the testimony of God is this, that He has testified concerning His Son.” (1 Joh.5:9). – And hear what He has called you to – and when He decides to call you, who are you to question that? – Now, listen to what He calls you to: “God is faithful, through whom you were called into fellowship with His Son, Jesus Christ our Lord.” (1 Cor.1:9). And He is faithful, He who called you to this! There is nothing insecure about this – it’s only mine and your heart that is so polluted by unbelief. But He also nailed that sin on the wooden cross – just don’t choose to remain in your unbelief. Yes, He is faithful, He who has called you, and notice then – if you also have been faithless. Don’t let any of the devils accusation, any judgment of the law or your own hearts condemnation drive you away from the Word of the cross! And not any teachings about the law, which tells you that there has to be more to it than “just” having faith in Jesus and His work to be saved - or a preaching that promise you a greater degree of holiness and growth as a Christian by anything else than growing in grace and knowledge in our Lord and Savior Jesus Christ. (2 Pet.3:18). Maybe you are trying to find room in your heart for Jesus – but listen first of all: There is room for you in Him!